Many occasions call for a fun Sunriver girls weekend — bachelorette parties, ski trips, sorority house reunions, new babies, or simply reconnecting with old friends. Friendships should be celebrated and Sunriver offers the perfect backdrop for your girls trip reunion whether you see each other several times a year or several times a decade. Plan you Sunriver girls trip with the help of Sunset Lodging in Sunriver. Booking a house will be one of the most important elements to take care of when planning a Sunriver girls getaway. Comfort is key! You want to spend time on this trip catching up with old friends and family members, which means comfy couches, a crackling fire, and maybe even a hot tub top your list of requirements for your vacation home in Sunriver. Consult with your group in advance to decide on your budget and make a list of must-haves and list of would-be-nice items for the home. Browse the selection of Sunriver vacation homes online at sunriverlodging.com or give us a call and we can assist you in finding the perfect home for your getaway. Remember, traveling in the “off-season” can often be more affordable for your girls trip and in Sunriver this means you may get the whole neighborhood all to yourselves. Ask us about our lower nightly rates in the off-season. Be sure to stop by the Sunriver Country Store to stock up on bottles of wine and an assortment of cheeses, salamis and crackers. Not into these kinds of snacks? The Sunriver Country Store has a variety of snacks to choose from to ensure you have everything you need for a Sunriver girls getaway. Looking to enjoy a great meal out? Check out the Sunriver Brewing pub in The Village at Sunriver or Marcello’s Italian Restaurant. Treat yourselves to the tasting flight of beers at Sunriver Brewing. Treat yourself to a delicious meal and then walk over to Goody’s for an ice cream treat with your girlfriends. Want a meal with a view? Drive out to the Marina off of Circle 3 and dine at the Peruvian-Mexican restaurant Hola, which sits along the Deschutes River. Want to relax in your PJs and have a lazy weekend with friends? Order pizza for delivery from Blondie’s Pizza, a Sunriver tradition for many guests. Blondie’s also can deliver pasta, calzones, salads and gluten-free pizzas. Looking to relax with your friends or try something new? When the weather isn’t ideal for paddleboarding or snowboarding, try taking an aerial yoga class at Downward Dog Yoga, located in the Sunriver Business Park. Not only can you take relaxing yoga and meditation classes, but Downward Dog offers Sunset guests a discount on classes, sweetening the deal even more. 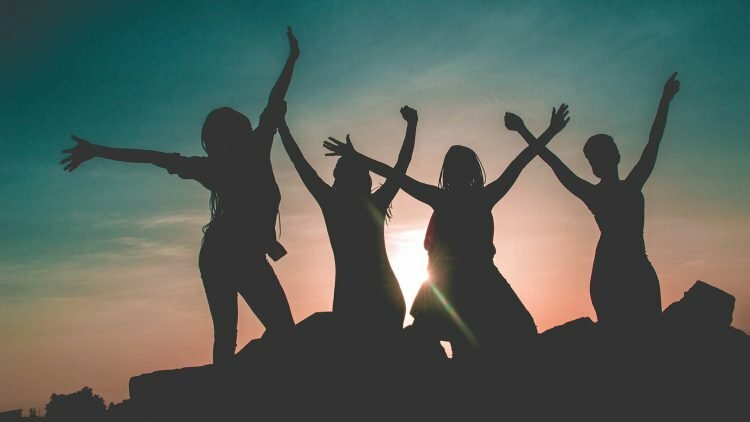 Whether coming together for a bachelorette party or for a simple weekend away with your best friends, group tours throughout Central Oregon can be a great option for fun and friendship. No matter where your interests fall, odds are you’ll find a tour to compliment your group’s interests. Outdoor adventures including kayaking and canoeing tours as well as girls-only mountain bike tours. Helicopter tours from Big Mountain Heli Tours give you the ultimate aerial view of the entire Central Oregon region. Living in the center of a craft-beverage focused community provides ample brewery, winery and distillery tours. Create memories that will last a lifetime with the friends and family members that matter most in your life by booking a Sunriver girls weekend getaway today. The reservationists at Sunset Lodging can assist you in finding the perfect accommodations and make recommendations on dining and activities during your stay. Find yourself at ease with a bottle of wine and your best friends in front of the fireplace catching up, playing games and spending quality time all together. What did we forget? Leave us a comment with your favorite Sunriver girls weekend activities.